Contains 4 full size bars - perfect for an indulgent chocolate treat at work, home or on the go. Rainforest Alliance Certified Cocoa. Suitable for Vegetarians. 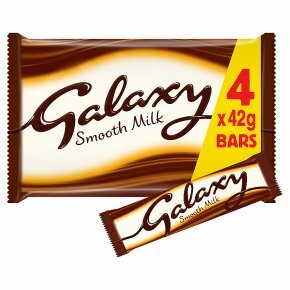 Kosher - KLBD-D. Four full size bars of Galaxy Smooth and Creamy Milk Chocolate a delicious and indulgent treat that can be enjoyed as part of a balanced diet and healthy lifestyle, lovingly created to melt in your mouth.